Back in 1989, all you needed to do to realize how badly Venezuela needed reform was pick up a phone. On a bad day it could take half an hour or more to get a dial-tone. You’d unhook the phone, go make yourself a sandwich, check for a dial town, eat the sandwich, check for a dial tone again, wash your dishes and put away the mayonnaise, come back and check for a dial tone again…it was pretty ridiculous. Ah, the days of the nationalized phone company. Working with 40 year old equipment, CANTV (as the company’s called) was far, far behind the technological and service curves. Waiting times to get a new phone line could extend into months or years. Predictably, the delays spawned their own little hotbed of corruption: if you needed a new phone line, you had to pay off somebody inside CANTV to bump you to the front of the line. It’s just one example, a particularly vivid one, but typical of the times. State-owned CANTV was prey to all the vices of clientelism run amok. Shielded from competition, the company could get away with bloody murder. As a consumer, you were powerless: a supplicant in the grip of a system that existed more to extract bribes than to provide phone service. But the rot wasn’t confined to the micro-level: macroeconomically, the country was also in serious trouble. The Central Bank was more or less out of foreign reserves. Protected by years of tariff barriers and subsidies, Venezuelan businesses were inefficient, rent-seeking leeches cranking out substandard goods at inflated prices. Thirty years of petrostate clientelism had turned the government into albatross around the nation’s neck. The public sector payroll was impossibly bloated. The petrostate model had degenerated into a full-employment scheme for governing party clients. In 1988, Venezuela had more public employees than Japan, but as the dark joke at the time went, “of course, in Japan they don’t get quality public services like we do here.” Lots of people on the state payroll showed up just twice a month to collect their paychecks, without doing any actual work. Many others treated their official salaries as a sort of retainer, but everyone understood that the real money was elsewhere – in the kickbacks, commissions and bribes that state jobs gave them access to. People were sick of it, and understandably so. But – and this is a crucial “but” – they didn’t see the need for root and branch reform. What they wanted was to see the petrostate fixed, not replaced. Venezuelan longed for the bonanza days of the 70s, when windfall oil revenues financed a huge and rapid expansion in consumer spending. If they were angry at politicians, it was because they thought politicians had failed to deliver on their basic mission to meet everyone’s needs by distributing the oil money fairly and generously. Do that, they figured, and the country could return to the good old days of the 70s. Now, what on earth CAP was thinking when he ran his campaign that way is still a subject of debate in Venezuela today. Looking back, it’s clear that the state was in no financial position to bankroll the whole of society anymore, and CAP must have known that. Some people think it was all a carefully calculated ploy from the start, that he knew he needed to talk the talk to get elected, but was aware all along that he wouldn’t walk the walk. Not everyone agrees. As one delicious anecdote would have it, CAP was certain that he could revamp the petrostate because he had already worked out a preliminary deal with the incoming US administration. The soon-to-be secretary of the treasury was fully on board for a financial rescue package that would allow the Venezuelan government to keep doing business more or less as usual…and that incoming administration would be run by President Michael Dukakis. Oops. Instead, he announced a program of massive, IMF-sponsored structural reforms – lifting tariff barriers, dropping subsidies, privatizing state assets…a straightforward neoliberal, Washington Consensus type program. Now, it’s easy to rant against the IMF, but context is key here. Given the scale of the mess that state finances were in, and the role petrodollar-funded patronage played in undermining state finances, there’s a good case to be made that radical reform was badly needed with or without the IMF. Which, in general, is my critique of the standard critique of the IMF: put forward in a context-vacuum, it fails to take note of the entirely Venezuelan reasons why reform was necessary to overcome the bottlenecks generated by petrostate clientelism. Be that as it may, it’s also true that CAP’s reforms were also a bald-faced betrayal of everything he’d stood for just weeks before he announced. The point is that there was nothing like political agreement for reform at that point. And CAP didn’t seem to think he needed to make the case for dismantling the petrostate. He thought he could just do it, steamroll over all opposition and present the country with a fait accompli. 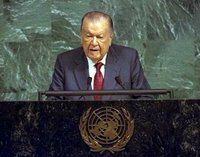 His thinking, apparently, was that the economic benefits of reform would be so evident within a couple of years that the critics of reform would be marginalized. Alas, he miscalculated badly. First off, CAP was elected on an AD ticket, as the candidate of the party that benefited the most from the petrostate model. In fact, arguably the main source of resistance to CAP’s reform push was his own party. CAP might have had a road-to-Damascus moment sometime after Michael Dukakis imploded, but the rest of AD was still very much wedded to petrostate clientelism. And CAP’s reforms were plainly incompatible with their vision of the state. Take CANTV. Sure, it was a nightmare for consumers, but who cares about consumers? For the AD patrons who got to run it, the phone company was a cherished power-base. Not only could they exploit their control over a scarce commodity – phone lines – to demand any number of bribes, enriching themselves and feeding their personal patronage networks, they could also use the company to listen in on their opponent’s phone conversations, to distribute CANTV jobs to clients, and, of course, to install multiple phone lines in their own homes. If you privatized the company, the phone system might start working, but the whole patron-client network it sustained would come crashing down. Similar arguments could be made about any of four dozen other state institutions CAP wanted to sell off, streamline, or reform. From the state owned steel-maker to the public hotel network, every bit of the petrostate had a powerful set of AD caciques dead set against reform. Soon, CAP found himself engulfed in a rising tide of unmanageable protest and dissent. Every scrap of reform met strong resistance in congress. AD patrons exploited people’s strong adherence to the petrostate cultural model to fuel resistance to reforms that would undermine their power bases. The IMF was predictably demonized, as was CAP for caving in to its demands. Many Venezuelans were genuinely outraged at what they saw as an unacceptable onslaught on their petrostate perks. In the end, too many people were too dependent on the cash that flowed through the patron-client networks for reform to be viable – and those who stood to lose the most were, by definition, easy to mobilize politically, precisely because they were part of the network. 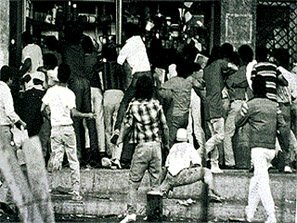 On February 27th, 1989, a group of far-left agitators in Guarenas, a Caracas suburb, started a small riot over the fare hikes. 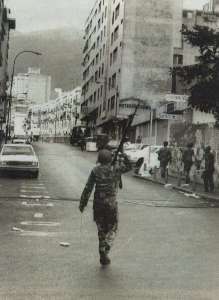 The riot spread incredibly quickly, first to Caracas itself and then throughout the country. For three days Venezuela went through an unprecedented spasm of rioting, arson, and very widespread looting. The police was helpless in the face of the sudden outburst of anarchy. Eventually, the government called out army troops with orders to shoot rioters on sight. At least several hundred people were shot dead in the next two days, by some estimates the real toll was over a thousand. The effect of the 1989 riots was in some ways analogous to 9/11 in the US: the event transformed the country deeply. Until then, Venezuelans had seen themselves as different, more civilized, more democratic, better than their Latin American neighbors. 31 years of unbroken, stable, petrostate-funded democracy had made us terribly cocky. In a sense, the riots marked Venezuela’s entry into Latin America. The country was no longer different: just another hard-up Latin American country struggling to put its democracy on a stable footing. But none of that mattered to the old-style patrons, the 10,000 little caciques heading up administrative fiefdoms large and small throughout the country. What they cared about was power, and CAP’s program constituted too big a threat to their habitual way of getting it. From their perches in AD’s National Executive Committee, in congress, in the courts, the nationalized companies and the labor movement, they were extraordinarily well placed to wreck the reform drive. It was during the third year of this little CAP vs. AD psychodrama that a certain army lieutenant colonel first entered the public scene…and with a bang. On February 4th, 1992, a group of junior officers launched a bloody coup attempt against the elected government. 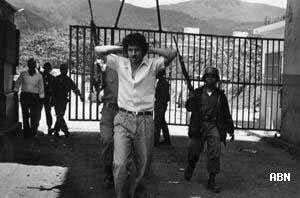 The crazy adventure – the first time someone had tried to overthrow a Venezuelan government by force of arms since the 60s – left about a hundred dead. But it also turned its leader into a kind of folk hero – the valiant paratrooper willing to put his life on the line to stop CAP’s outrageous drive to dismantle the cherished petrostate. The coup-plotting lieutenant colonel went to jail, where he whiled away two years reading (but not understanding) Rousseau, Bolivar and Walt Whitman. In those two years, the government faced a second, even bloodier coup attempt by officers loosely associated with the first. 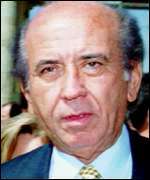 Eventually, CAP was impeached by his fellow AD party members on flimsy charges, and after a brief interim government, the presidency passed to yet another petrostate dinosaur – Rafael Caldera, who had also been president already, but even further back than CAP, in 1969-1974. 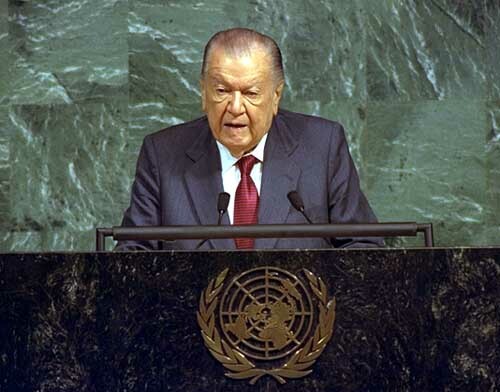 By the time he reached power for the second time, Rafael Caldera was over 80 years old. He’d spent 58 of those years in front-line politics. Frail, some would say decrepit, his voice tremulous and barely audible, he wasn’t exactly the kind of leader you’d turn to for bold new ideas. Caldera tried to patch up the old petrostate system – the only one he understood – as best he could. Predictably, he failed. Corruption continued unabated, cronyism as well, while the banking sector collapsed, the economy languished, and the nation’s collective impoverishment continued afoot. Eventually, he was persuaded of the need for some reform, including an important overhaul of the criminal system and of social security. But he didn’t understand, much less share, the notion that the basic model of the state he had spent a lifetime championing needed a total overhaul. Disenchantment with the old party structures ran so deep that Copei didn’t even bother to try to run a party insider as candidate. Instead, they tried to co-opt the beauty queen, Irene Saez, who collapsed in the polls the second she accepted their nomination. As always, AD was the last to get the message: they nominated Luis Alfaro Ucero, a semi-literate 80 year-old cacique, a sort of capo di tutti i capi sitting at the pinnacle of the party’s patronage structure. The guy never got beyond 7% in the polls. The much vaunted adeco patronage machine had sputtered to a halt. Soon enough, it was all down to the governor and the coupster, and it was clear that the election would go to the one who best voiced the people’s virulent rage at the ongoing failure of the petrostate. The scene went down in the middle of one of his infamous, never-ending televised speeches in 2004. President Chavez had barely hit his stride when something caught his eye. His tone changed. Concerned, he started looking towards the scaffolding to the left of the stage he was using, the one used to put up the lights for the speech. Welcome to the new era of chavista postinstitutional clientelism. This sort of thing is typical of Chavez’s governing style. The president never turns down a personal plea for help, at least not in public. His weekly TV call in show amounts to a parade of supplicants – each week, the lucky few who manage to get their calls through see their wishes for a job or a pair of crutches or an operation fulfilled. The president works hard to make the entire audience feel how much he wants to help them all, personally, one by one. Chavez’s peculiar contribution to the concept has been to cut out the middlemen. In the old system, each client’s relationship was with the patron immediately above him. But the chavista patronage system only has two levels: the president and everyone else. The old system was held together on the basis of the personal bonds between people in adjacent levels of the pyramid. These days, the relationships that hold up the system are imagined rather than personal – the charismatic leader’s bond with each of his followers individually. Though Chavez has spent billions of dollars on emergency social programs that effectively re-distribute petrodollars to his political supporters (the famous misiones) I’d argue that his success has almost as much to do with raw sentiment, with primary identifications. Many chavistas feel deeply, personally, almost mystically wedded to the president – the intensity of their emotions towards him are hard to overstate. I’ve heard journalists describe meeting chavistas who carry nothing in their wallets but an ID card, an icon of the virgin mary, and a picture of El Comandante. That’s a departure from what we’d seen before. In the old system, the relationship between patrons and clients was basically a quid-pro-quo, a matter of mutual interest. Insofar as feelings played into it at all, they didn’t go beyond a certain deference born of respect and fear of the boss. With Chavez, the bond comes from the heart. Chavez’s rhetoric is so powerful he makes people want to see him as a saviour: they want to cry on his shoulders, they want to redeem themselves through him. courts and the elections authorities and the nationalized companies and every other part of the state was subjugated to one party or the other. But at least there were two of them! If nothing else, AD and Copei served to balance each other off. No truly transcendent decision could be made without at least a tacit agreement between the two. 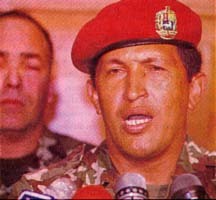 In the chavista state, there is only one institution: Hugo Chavez. Note that I’m not talking about the office of President of the Republic, I’m talking about Hugo Chavez personally. When an important policy decision has to be made, the only deliberations that matter take place between his ears. All loyalties are directed at him personally. Supporters are in no doubt, their gratitude for the misiones is not directed at the state generally but at him personally. With the president locked in a circle circle of relentlessly sycophantic collaborators, all dissent is equated with treason. 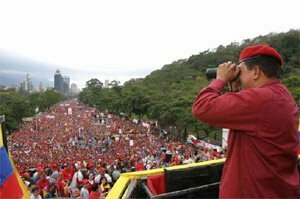 The one man who makes every relevant decision personally is never confronted with a view of the world that differs one iota from his own.Chavez has largely blurred the the institutional distinctions between state, government, party, presidency and president. The result is an accelerated decay in the state’s institutional structure, to the point where no part of the state can act independently of Hugo Chavez personally. Venezuela today is an exercise in turbocharged personalism. Of course, Chavez thinks of himself as the pre-eminent critic of the post-1958 state. But his critique is based on ideas that have always been at the heart of the petrostate’s cultural model. Chavez certainly thinks he’s rebuilding Venezuela’s political and social structures from the ground up. But like so many self-described revolutionaries before him, he’s blind to how much his vision has in common with the old regime. Again, the central conceit of the petrostate cultural model is the idea that the state can and should use its oil wealth to bankroll society. Rather than a critique of the petrostate as such, what Chavez provides is a critique of the way it went astray in the 1970s and 1980s, and particularly of attempts to dismantle it, such as CAP’s. Chavez doesn’t realize it it, but his outlook places him squarely in the intellectual tradition pioneered by Romulo Betancourt more than 50 years ago. Because the clear implication of his line of reasoning is that the old party bosses forfeited the state’s mission, which was to distribute petrodollars to the people. Ultimately, Chavez is just peddling a very old petrostate line – the old longing to fix the petrostate, to reform the unreformable. That longing has been the key to his political success. In beating the old petrostate drum, Chavez taps into a rich vein of Venezuelan culture. Breaking the petrostate’s hierarchical social system is child’s play compared to the monumental task of breaking the petrostate as an idea, as a collective understanding of what the state is for. And Chavez never challenged the dominant understanding on that score, he merely leveraged it to his own advantage. In 1998, the voters wanted to hear someone tell them that the country is rich, that prosperity is their birthright, and that the only reason they are poor is that their share of the oil money was stolen. They wanted to hear that because that was what they intimately believed. And Chavez articulated it brilliantly. With amazing vigor and charisma, he captured the volcanic anger people felt about the breakdown of the old model. Chavez became their voice. So they voted for him. What could be more natural? There’s just one minor inconvenience: the Chavez era has made the petrostate model even more unworkable than it was at the outset. Oil production has fallen. Chavez’s mismanagement of the oil industry has left the state dependent on periodic oil booms to generate the resource stream he needs to finance his promises. That’s worth a brief explanation. Those of us who don’t work in the oil industry tend to think of oil wells more or less as water faucets: you want oil, you just turn the thing on. It doesn’t quite work that way. As oil wells age, their pressure decreases, and increasingly complex methods are necessary to keep the black stuff flowing. That costs money, so, as oil wells get older, you need to invest more and more money just to stay even. Venezuela’s rate of depletion runs at about 20% a year, meaning that, in the absence of new investment, that’s how much our production capacity would fall each year. Hugo Chavez either doesn’t understand that or doesn’t care. Since 1999 his government has pressured PDVSA so hard to hand over more and more cash that the oil men haven’t had enough money on hand to even maintain capacity. Insufficient investment has sent Venezuela’s capacity tumbling – from 3.8 million barrels per day in 1998, capacity had fallen to about 3.3 million b/d at the end of 2002. After the oil strike, capacity is thought to have shrunk farther still, though reliable data is hard to come by. In December 2005, the International Energy Agency, perhaps the most impartial source on the matter, reported Venezuelan production was down to 2.6 million b/d. So one of the many, many contradictions and ironies of the chavista era is that the president hangs on to the petrostate’s founding myth even as he chips away at the oil industry’s ability to finance it. If the state couldn’t really afford to bankroll society in 1988, and less still in 1998, it really, really can’t today.